Home » Uncategorized » Cory Who? It was exactly one month ago, on August 12, 2012 that the Toronto Argonauts parted ways with two-time CFL all-star running back, Cory Boyd. At the time of his release, Boyd was leading the Canadian Football League in rushing with 447 yards. It was not long prior to Boyd finding himself a new home in the Canadian Football League. Cory was able to strike a contract with the Edmonton Eskimos just hours following his unexpected release in Toronto. 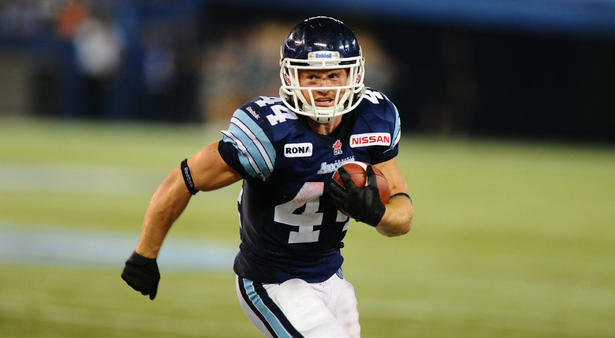 The release of Boyd certainly came as a shock to many fans and CFL experts but it also presented second-year CFL running back, Chad Kackert with a new opportunity in the Argonauts organization. The Simi Valley, California native has taken the reins of the Argonauts’ starting running back position and has more than proven his capabilities of being a star in the CFL. Kackert has started four consecutive games for the Argonauts’ following the release of Boyd and his performance has been nothing short of spectacular during that span. The Argonauts’ are currently 3-1 with Kackert as the team’s leading running back. The Argos’ offence also seems to be hitting its stride at a critical point in this 2012 season. Kackert has already surpassed his 2011 rushing totals. The 25-year old currently ranks ninth amongst CFL rushing leaders with an incredible 365 yards in just four games as the Argos’ starting running back. Kackert’s phenomenal 7.6 yards per carry average currently ranks second amongst running backs in the Canadian Football League and his five touchdowns rank third amongst fellow tailbacks. There is no doubt that it will be difficult for Chad to maintain his torrid pace but his main impact in the Argonauts’ lineup comes from more than simply a statistical standpoint. Chad has been a very reliable pass blocker for the Argos’ and has also provided Ricky Ray with a new weapon in the team’s passing attack. Kackert has recorded nineteen catches for 185 yards receiving so far this season. Ricky Ray’s most recent success also comes as a result of having Kackert in the backfield. The Argos’ have a renewed running attack, which has kept opposing defences off balance and has provided Ricky Ray with the opportunity to stretch the field with the Argonauts’ tremendous wide receiving core. Kackert’s 172 yards rushing and three touchdowns against the Hamilton Tiger-Cats on Saturday afternoon earned him Player of the Week honours for Week Eleven in the Canadian Football League. Kackert showed flashes of brilliance as the Argos’ starting running back last season when Cory Boyd was absent due to injury. He managed to rack up 349 yards and four touchdowns in just five games as the Argonauts’ starting running back. Despite his impressive statistics, he struggled with ball control as he fumbled on three different occasions during his five-game stint as the team’s starting tailback. This season however, has proved to be a different story as Kackert has yet to put the ball on the turf in his forty-eight rushing attempts during this 2012 campaign. Kackert seems to have also assisted the Argonauts’ offence in reaching its full potential in 2012. The Argonauts’ have scored the most points in the Canadian Football League over the course of the past couple of weeks. Saskatchewan’s 52-point outburst against the Winnipeg Blue Bombers on Labour Day weekend could not even match the Argos’ 78 points combined in their home-and-home sweep of their rivals, the Hamilton Tiger-Cats. At first, the release of Cory Boyd looked like a horrible move on the part of the Argonauts’ and for obvious reasons. Many experts and analysts thought that this was the beginning of the end of the Toronto Argonauts 2012 season. However, currently the move looks like a true blessing in disguise and following every single explosive Chad Kackert run, Argos fans across Canada realize that the decision may have been the most necessary change of the Argonauts’ entire season.